� Slick's first ever AVP main draw came in Hermosa Beach in 2010 when teaming with Olympic Gold Medalist Dain Blanton. The tournament marked the final pro beach event Blanton ever played. � In the 2016 season opener in New Orleans, Slick had a partially detached retina in his left eye and ever since has worn protective goggles while playing. � In his career Slick has played with six different Olympians (Dain Blanton, Adrian Carambula, Casey Patterson, Todd Rogers, Sean Rosenthal and Indoor Olympian Reid Priddy). 2018: Slick formed a partnership with Casey Patterson, getting a best of third in their six AVP events together. Slick was sixth on the Tour in blocks (1.42 per set), sixth in hitting percentage (.475) and tied for 10th in aces (.65 per set). Slick played nine times on the FIVB Tour. After placing 17th with Eric Zaun, Slick and Patterson played eight events, with a best of a bronze medal in a three-star tournament, his first FIVB medal. 2017: Slick and Billy Allen played eight events on the AVP Tour, winning once, finishing second twice, and finishing third twice. Their five semifinal appearances tied for the most of any team. Slick was third in blocks (7.35 per set), eighth in blocks (1.43 per set) and eighth in hitting percentage (.444). Slick and Allen played four international events on the FIVB Tour, placing 17th three times. 2016: Slick played six AVP tournaments with four different partners. He played once with Billy Allen, twice with Ty Tramblie, twice with John Mayer including his season best of third place, and once with Todd Rogers. Slick was ninth on the Tour in blocks (1.48 per set). On the FIVB Tour Slick and Mark Burik played three times, with a best of 17th. 2015: Slick partnered with Todd Rogers, and the duo had a best of a third-place finish on the AVP Tour. Slick ended the year ranking 10th in blocks per set (1.41) and 10th in hitting percentage (.421). In their first event together, in China on the FIVB Tour, Slick and Rogers finished fourth. They played three FIVB events on the season, and Slick also played three tournaments with Sean Rosenthal. 2014: Slick teamed with Adrian Carambula on the AVP Tour, and they got their two best finishes in the last events of the year, placing third both times despite having to win three contender's matches in each event. Slick ranked fifth in kills per set (6.71), eighth in blocks per set (1.54) and ninth in hitting percentage (.399). Internationally Slick played four FIVB events with Will Montgomery and three with Derek Olson, getting a best of ninth with each player. 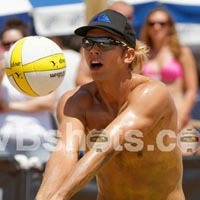 2013: Slick played the AVP season opener with Casey Jennings, then played one event with Engle. He then formed a partnership with Adrian Carambula for the final five AVP tournaments. Despite having to twice play in the qualifier, the duo had three fifth-place finishes and one semifinal appearance, Slick's first ever on the AVP Tour. Slick made his debut on the FIVB Tour early in the year with a pair of events with Jennings, including a finish of 17th in Long Beach. At the end of the season he and Will Montgomery played in two FIVB qualifiers, with a best of 25th. 2012: Slick continued his partnership with Engle on four different tours, and also played two events with two other partners. 2011: Playing on three different tours, Slick had a best of third with Evan Engle in eight events, and also played one tournament with Marcin Jagoda. 2010: Slick played one qualifier with Clint Coe, then in Hermosa Beach partnered with Dain Blanton, finishing 17th. 2009: Slick made his pro beach volleyball debut in Chicago with an AVP qualifier with Ryan Vander Veen. College: Slick first played volleyball while at Minnesota-Deluth, then transferred to the University of Minnesota, where he played on the club volleyball team. Personal: Slick was a member of the 2009 USA Beach Volleyball High Performance Team (U26). Slick is married to Julie (Motz), who was a middle blocker at Michigan Tech, setting the school record for season blocks and leaving the school with the third best career hitting percentage. They have a son (Edison, born in 2016) and a daughter, Delaney (born in 2018).